A few things I've found funny recently (in one meaning of "funny" or another), from short to long. "Dexter" is Latin for right (as in right-handed). By a touch typist on a normal QWERTY keyboard, it's typed solely with left-hand keys. “Brazil,” as the result was eventually known, is the first film to have a country named after it. It’s bound to arouse strong feelings. But Gilliam is no stranger to controversy — he once took a melon back to a shop — and in his characteristic way he’s ready for anything. Andy Kindler, ace stand-up comedian, penned a piece about starting out in hack comedy for National Lampoon in 1991 which he reproduces on his website. It's called The Hack's Handbook: A Starter Kit. Funny 'cause it's true, and the dated references make it even truer. Books in those early times, whether orthodox or heterodox, appear to have had a precarious existence. The heathens at each fresh outbreak of persecution burnt all the Christian writings they could find, and the Christians, when they got the upper hand, retaliated with interest upon the pagan literature. The Mohammedan reason for destroying books -- ``If they contain what is in the Koran they are superfluous, and if they contain anything opposed to it they are immoral,'' seems, indeed, mutatis mutandis, to have been the general rule for all such devastators. 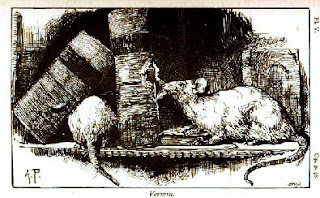 Vermin, a plate from The Enemies of Books.